This online documentary centers on the May 20, 1968 takeover of President Odegaard’s office by members of the UW Black Student Union. The video narrates the landmark event, setting it in the historical context of the late 1960s, and demonstrating its lasting impact on the University. 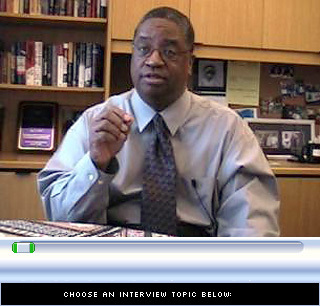 Charlie Hinckley produced the video for UWTV Productions and the Office of Minority Affairs and Diversity. It can be viewed in several online formats. This special section explores the history of African American student activism at the University of Washington. 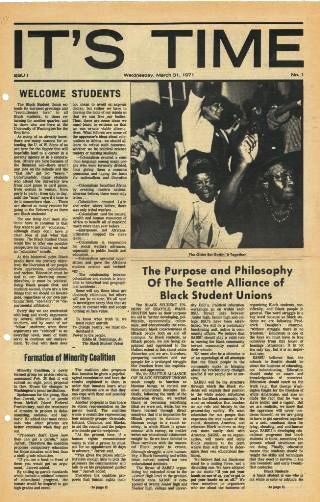 The Black Student Union was founded in early 1968 at a time when very few black students attended UW. Over the next several years the BSU led campaigns that transformed the University and helped reshape educational opportunities for young people of color in Seattle and throughout Washington state. 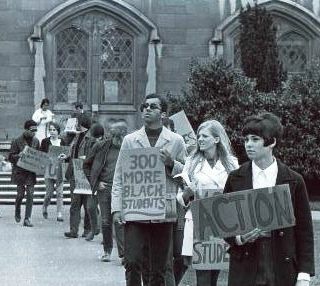 In Spring of 1968, the BSU initiated a string of militant actions at both the UW and in Seattle High Schools, demanding changes in admission policies and curricula. When the BSU seized the office of UW administration building during a meeting of Faculty Senate Executive Committee, President Charles Odegaard and Senate leaders agreed to a set of reforms that matched some of the protest demands. Within a year the number of African American students at UW tripled, from 150 to 465, Native American students increased from 25 to 100, and Chicano students from 10 to 90. In addition, the University established a programs in Black Studies, and doubled the number of African American faculty. Chicano Studies, Asian American Studies, and American Indian Studies programs would folllow. Changes in the Athletics programs and the establishment of the university’s Office of Minority Affairs also followed from BSU inspired reforms. 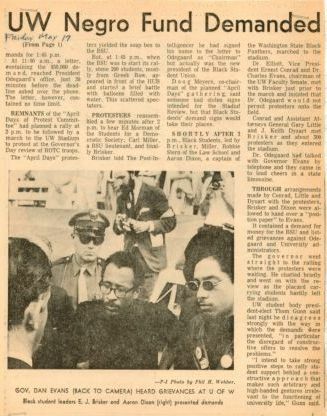 This page introduces a special section on the early history of the Black Student Union. Links above and below lead to oral histories, several photographic collections, rare documents, important essays, and an archive of digitized newspaper articles. Marc Robinson started this project. Additional thanks to Tikia Gilbert, Edgar Flores, Emile Pitre, Larry Gossett, and Charlie Hinckley. Daren Salter edited this section. Oral Histories: short biographies and streaming video excerpts of interviews with former BSU members Larry Gossett, Aaron Dixon, Garry Owens. The BSU today: The UW chapter of the Black Student Union has thrived for almost fifty years and today continues to play a leadership role at the University of Washington. 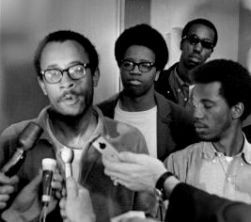 Oral Histories: former BSU members Larry Gossett, Aaron Dixon, and Garry Owens discuss the early years of the BSU, the climate at the University of Washington, and their own activism in streaming video interviews.